Assurance of faith is the conviction that one belongs to Christ through faith and will enjoy everlasting salvation. It is more than believing the gospel - it is believing that these truths apply to you. Having assurance affects life in more ways than forgiveness of sin, alleviation of guilt, and salvation from the punishment of hell - it affects your whole being, firing up your affections for Christ, your unshakable trust in God, your burden for the unsaved and your joy in life and even death. 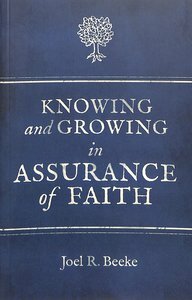 About "Knowing and Growing in Assurance of Faith"